"Discover everything you ever wanted to know about being a leader"
Our leadership experts have created content rich online material that will assist with the development of your leadership capabilities. Including practical guidance, tips and techniques .......... and all of the forms you will need. Visit the Leadership Skill Quick Find Index to find everything you will need! For team leaders there is also a Supervision quick find page that provides everything a supervisor will need to help you to master this first level of management. Some of this sites more frequently visited leadership pages include Performance Management, Performance Appraisal, and the Top 9 effective leadership skills. The "what makes a good leader" team are committed to providing more high quality, practical free online resources to help with your development. Our strategic planning experts have developed world class online content that will help guide you through the process of developing your own strategic plan. Visit our strategic planning quick find index to quickly navigate to a "how to guide" that will suite your needs and download our free templates. 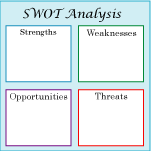 Also see SWOT Analysis, Macro Environment Analysis, Porters five forces, Internal Analysis. SWOT Analysis: learn all about a SWOT Analysis, from your internal strengths and weaknesses to your external Opportunities and Threats, find many examples and three SWOT templates to choose from. The what makes a good leader site offers you an opportunity to show case your strategic skills by allowing you to upload your own environmental observations. To show case your analysis skills click here! For small business we offer a simple strategic planning process with detailed how to guides and simple templates that will help you to achieve your goals. Our leadership experts have combined their talents to connect you with premium quality online coaching materials designed to expand your knowledge and keep you current with trends in the team leader role. How would you like to get into the minds of your people and motivate them to share your vision? Copyright © 1997-2009 whatmakesagoodleader.com All rights reserved.